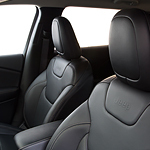 The Jeep Cherokee is a large, comfortable, and popular full-size SUV. The luxury and comfort that this vehicle offers is offset by a wide variety of safety-enhancing technologies. These technologies include goodies such as specialized adaptive cruise control systems, keyless vehicle operation, and even automatic accessory notifications. The Jeep Cherokee offers drivers the convenience of proprietary Adaptive Cruise Control. The Jeep Cherokee system also includes specialized Stop and Go service that can slow down or speed up the vehicle in order to maintain position within traffic flows. Another feature that both enhances safety and makes life easier for vehicle occupants is the highly capable Jeep Cherokee key fob. By just carrying the Jeep Cherokee fob, vehicle operators can seamlessly enter and exit their vehicles without ever touching locks. Plus, the key fob allows drivers to activate their vehicles with a simple push of a button.